The speaker system has a stylish design and has a powerful and clear sound. 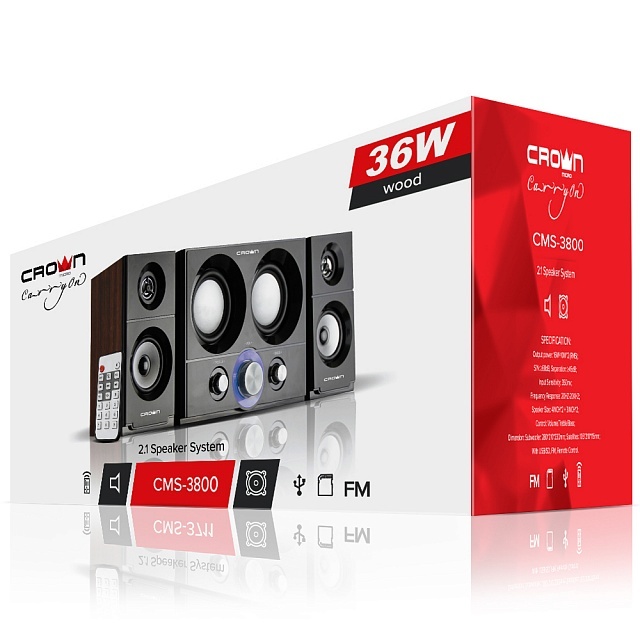 Sound power 36W dimmable, you can adjust the treble and bass on the front panel for all tastes. Housing made of MDF with color "tree" perfectly fit into any interior, while the subwoofer and satellites can be formed into a single system due to the same height. Built-in USB decoder and card reader allows you to play music from flash drives and memory cards, and an FM receiver diversifies music library. Also included is a convenient remote wireless control. This product is packaged in a branded, secure box of cardboard. The kit includes: Instructions, subwoofer, the satellites * 2 pcs remote control. 105*210*115 mm * 2 pcs.